These are lyrics by J. Geils Band that we think are kind of repetitive. my angel is a centerfold. Say it again guys. Like we didn't hear you the first 20 someodd times you said that. 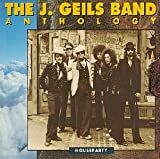 J. Geils Band's, "Love Stinks"
After about a minute and umpteen repercussions of this line, the song starts to stink, too.